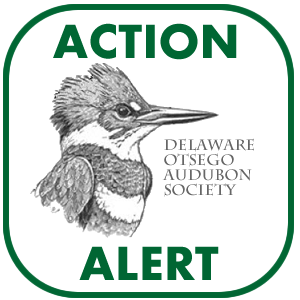 The Delaware-Otsego Audubon Society Sanctuary overlooking Oneonta, NY, is a 100 acre property providing marked hiking trails through a variety of habitats, such as open fields, second growth forest, old pastures, and mowed fields. A large wetland is accessible by trails and a short boardwalk. 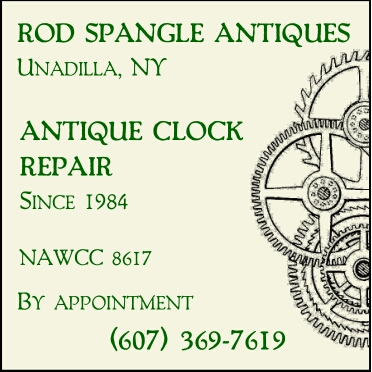 Located at 52 Grange Hall Rd. 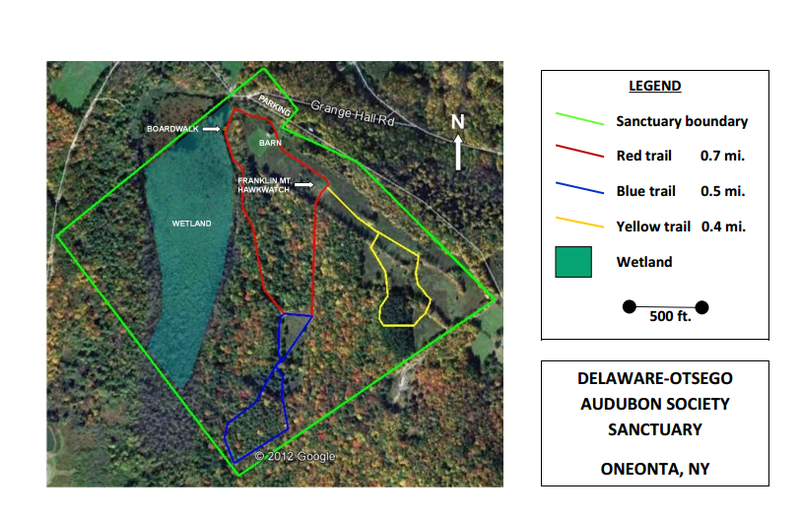 Spur, Oneonta, NY, the Sanctuary is home to a large diversity of wildlife, including many bird species, mammals, amphibians and reptiles, plus a variety of native plants. The Sanctuary is also the site of the Franklin Mt. Hawkwatch, one of New York State’s premier fall hawk watches. It is particularly noted for late season flights of Red-tailed Hawks and Golden Eagles. Franklin Mt. provides a panoramic view of the Susquehanna River valley and surrounding hills of Otsego and Delaware Counties. Other activities at the Sanctuary include an annual open house, a summer day camp for children and a raptor banding station. The DOAS Sanctuary is open to the public. 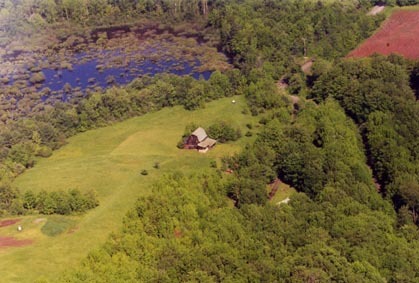 The Delaware-Otsego Audubon Society Sanctuary overlooks Oneonta, NY from the south. Click here for photos submitted on a Fall Walk through the Sanctuary! From I-88 eastbound, take Exit 14. Turn right after the exit, go straight at the light, crossing Rte. 28. Immediately turn left at the T onto Southside Dr. Turn right on Swart Hollow Rd. (0.8 mi.). Go 1.5 mi. and take a sharp right turn onto Grange Hall Rd. Take sharp left turn into the driveway (0.2 mi.) and park on the right side. Walk up to the barn, where a map and information are posted. From I-88 westbound, take Exit 15. Turn left at the bottom of the ramp, right at the light by McDonalds and go to the 4th stop light (0.7 mi.). Turn left at this light and follow the directions above from the Southside Dr. T.
From Rte. 17 westbound, take Exit 94 (Roscoe), then Rte. 206 north to Walton (20 mi. ), then Co. Rte. 21 to Rte. 357 (12 mi.). Turn right on Rte. 357 to Rte. 28 (8 mi.). Take Rte. 28 south for 1/4 mi. to a crossroads with a small church on the right. Turn left onto Grange Hall Rd. for about 3 mi. to a point where it takes a 90 degree right turn. A short distance on the right is the driveway noted above. From the NYS Thruway at Kingston, take Rte. 28 north through Delhi, (70 mi.) About 15 miles beyond Delhi, look for a crossroads with a small church on the left. The right turn is Grange Hall Rd. Follow directions as above.